Now is prime seed saving time. Peas, lettuce and other cool season crops are are maturing and their seeds are almost ready to harvest. One of the most important things, besides basic seed saving information, is having packets and a place to store the precious seeds for next year’s garden. I got the instructions for this paper seed envelope pattern in a public domain book about children’s gardening on Project Gutenberg, which I haven’t been able to find since. I drafted the pattern and have been using it for quite a while now. I made a traceable template out of lightweight cardboard box. Any cereal, cheez-it, or snack food box will work. The pattern can also be printed on regular or reused paper. Instructions: Pre fold tabs A-C on dotted lines. Fold and glue in alphabetical order. Fold tab A. Apply glue to the outside vertical edge of tab B. Glue tab B to back of tab A. Fold tab C over edge AB and glue. Write the harvest date and contents. The envelope is ready to be filled. 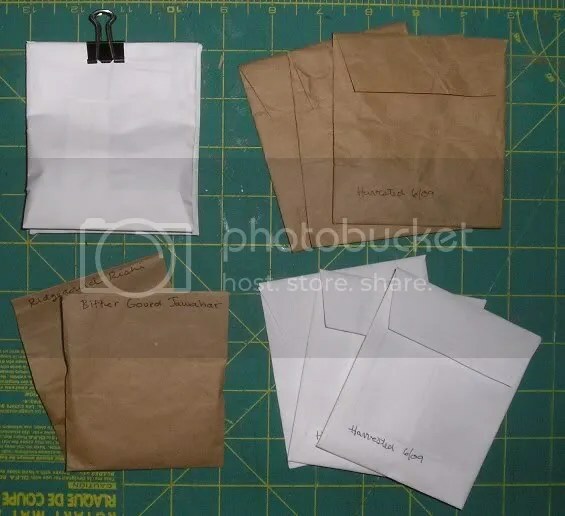 I usually wait until sealing before folding tab D.
Click on the link Printable Seed Packet and Adobe Reader will open a PDF that you can print and save. The seed police came back! My tangerine seedlings grown from store-bought fruit were the first to put-out exuberant new growth as the days grew longer. I promise they are NOT key limes grown from seeds that I bought from an uncertified seller. Would you believe… the seed police came back a second time this winter after the fiasco when I surrendered my poor seedling. They came back looking to clarify the purchase dates, but really there’s nothing I can do to retrieve records from 2006, it’s just too long ago. DH, ever so kindly dealt with the gentleman, here is his first-hand account. * Reference for fans of the film Kung Fu Hustle. They also sent me forms in the mail. I had to sign two copies of everything, one for the USDA and one for my records, certifying that I had bought the seeds. The irony in this situation, at least to me, is that seeds of all types of citrus fruits are shipped everywhere within the fruits themselves, so it is fine to sprout seeds from fruit purchased at the grocery store, but if you want to buy seeds specifically for propagation you must buy from a certified seller. Many types of citrus fruit grow true from seed, including tangerines and Key Limes, but not Persian limes, the typical green lime sold in grocery stores. 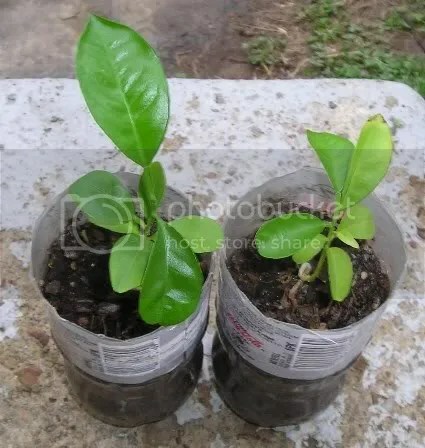 If you are interested in growing citruses from seed I recommend checking the GardenWeb Citrus forum to make sure the variety you choose grows true to type. The winter solstice has passed and the days are becoming longer. It is the perfect time to winter sow seeds for next year’s garden. The balmy air and 70 degree weather are signaling to the seeds that spring will be here soon. I first discovered winter sowing last year when I wanted to get a good head start on lettuce and greens for the spring. In the past, I’ve had a lot of trouble with baby lettuces frying in the extreme heat, or failing to germinate in the hot baked-clay soil. The results of my winter sowing spoke for themselves. In one 3″x”3 container I was able to grow more lettuces than I had in an entire year of direct sowing. The seedlings were vigorous, never leggy, and they were perfectly timed to mature before the summer heat. Cool season crops like lettuce, spinach, Alliums, and Brassicas are not the only ones that benefit from winter sowing, even heat loving vegetables like tomatoes and peppers, squash, and melons are good candidates for winter sowing. I first read about winter sowing on the GardenWeb Winter Sowing forum. In the Spring it’s like a party on there with hundreds of users excitedly reporting their germination results. Most of the information found in the FAQ section is compiled by Trudi Davidoff, who also operates WinterSown.org, a great not-for profit website with tons of winter sowing information. They also seed send-out free seeds! WinterSown also includes germination results for every zone, so you can get an idea of what does and doesn’t work. So far, the only thing I’ve seen that doesn’t work are morning glory seeds, which is sort of surprising since they are usually known for tenacious reseeding. Winter sowing can be extremely exciting and rewarding. Like any gardener, I get itching to plant seeds in the dead of winter and this is a great way to do that while also getting a jump on the planting. It’s also exciting to see tiny green sprouts emerging from the winter, even under sown-covered containers. Check out Trudi’s website for tons of inspiring photos and plant some seeds! My favorite part about winter is buying new seeds for next year’s garden. Here are a few of the seeds I bought that are totally new to the line-up. Kentucky Limestone Lettuce, The Original Bibb Lettuce developed by Jack Bibb in the 1800s. Hopefully it will love our Tennessee limestone soil just as well. Yellow Of Parma Onion. Onions are totally new for me, but they are a very important part of the vegetable pantry. Hopefully, starting this early in the year will yield a good harvest. Stowell’s Evergreen Corn. Is a late season white sweet corn, developed by Nathan Stowell of New Jersey in the 1800s. Golden Bantam Improved, a yellow kernel corn. By planting two variates of corn, one early and one late, I should be able to extend the harvests, as well as, saves seeds for the two separate varieties. Ace Pickling Cucumber. I hope it’s not too ambitious to try to make my own cucumbers…our landlady does. German Rhubarb. I love rhubarb, but it grow best in the North, from what I read it is possible to grow and harvest rhubarb in the South, as an annual, although it grows smaller stalks. Oregano Greek, according to Grecian blogger CityGarden, Greek Oregano, Oregano Vulgare Hirtum is the real thing, more potent and intense than standard Vugare forms. Blue Podded Blauwschokkers, Blue Podded shelling peas, aka, Capucijner Peas, named after the Catholic/Franciscan Capuchin Monks who developed this variety. The peas are vigorous, growing up to six feet on a trellis. Charentais Melon. Need I say more? Grandma Einck’s Dill. For the pickles! This is one of the original seeds that began the Seed Savers Exchange, it was brought over from Bavaria by one of the founder’s Grandmother. It is a dual-purpose dill, used for its leaves and seeds. Amish Paste Tomato. After numerous disappointments with hybrids and beefsteaks, I’m resorting to this revered all-purpose sauce tomato, with lots of meat. German Chamomile, Sages, Snap dragons, and Scarlet Clove Pinks, another name for Carnations. Cupani’s Original Sweet Pea. The sweet pea is purported to be the Original sweet pea sent into England in the 17Th Century by an Italian monk. Sweet peas are also supposed to be rabbit resistant, which is a huge plus for me and anyone also who has a rabbit problem.